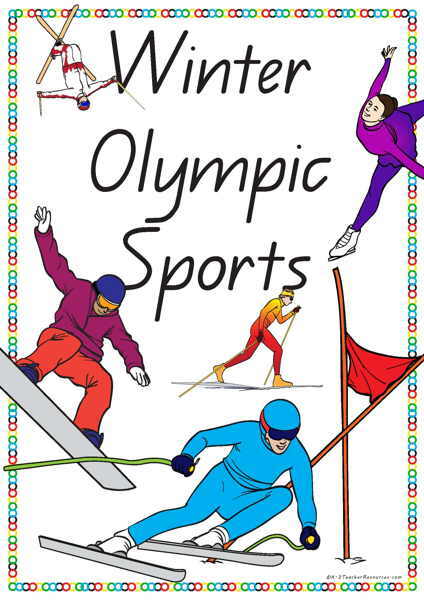 Printable Winter Olympic Sports Picture and Word Cards. Ideal for Winter Olympics 2014, Sochi . Classify these winter olympic sports words into Team and Individual sports – discuss the differences – pros and cons. You can make these words smaller size by using the reduction settings on your printer and just printing off black and white copies, these smaller sizes are great for cut and paste activities such as cutting out the words and pasting them in alphabetical order, or into the sporting categories as mentioned above. Print out the bright full copies, glue them onto colourful backing card – laminate and make a Winter Olympic Sports Wall Display. These are then ready for children to refer to during writing sessions. When not being used on a wall display, place them in labelled boxes, or hanging pockets for continued use and reference. Make a jigsaw puzzle. Make up a second set of cards, cut the picture section off using a zigzag or curve cut like a jigsaw (you can even cut through the word to make it more of a challenge) Children then match the 2 or more pieces. Also great for breaking up syllables or blends within words. Discuss how athletes in the Olympics have had to work to get there, eg. lots of practice and dedication. Relate to ‘healthy food‘ concept and words and how sport / exercise, sleep and healthy food equals a healthy body and healthy mind. Thank you for contacting us. I’m sorry to hear that you are having printing issues. I hope I can help! The first suggestion would be to ensure you have the latest version of Adobe Reader installed. Once you have done this, please try printing again. If the issue persists, perhaps you could try turning on and off the “print pdf as image” setting. I hope this information helps. If you have any further questions, please let me know. I’m happy to help!